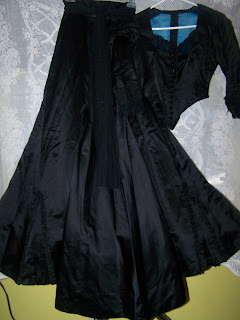 UP FOR AUCTION IS A BEAUTIFUL VICTORIAN CORSET BODICE AND SKIRT (DRESS). I RECENTLY PICKED THIS UP AT A ANTIQUE AUCTION. I DO NOT KNOW THAT EXACT AGE OF THIS DRESS HOWEVER IT WAS SOLD AS AN ANTIQUE AT THE AUCTION. 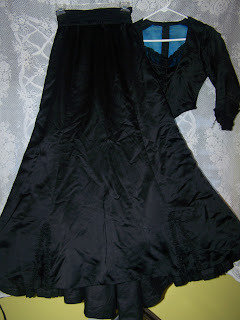 I TRIED TO TAKE AS MANY PICTURES AS I COULD TO SHOW THE CONDITION OF THE DRESS BUT THERE ARE A FEW FLAWS THAT ARE NOT PICTURED. I WILL TRY AND EXPLAIN AS MUCH AS POSSIBLE, IF YOU HAVE ANY QUESTIONS PLEASE ASK, I WILL GET BACK TO YOU AS SOON AS POSSIBLE. I BELIEVE THIS DRESS IS MADE OF SATIN. 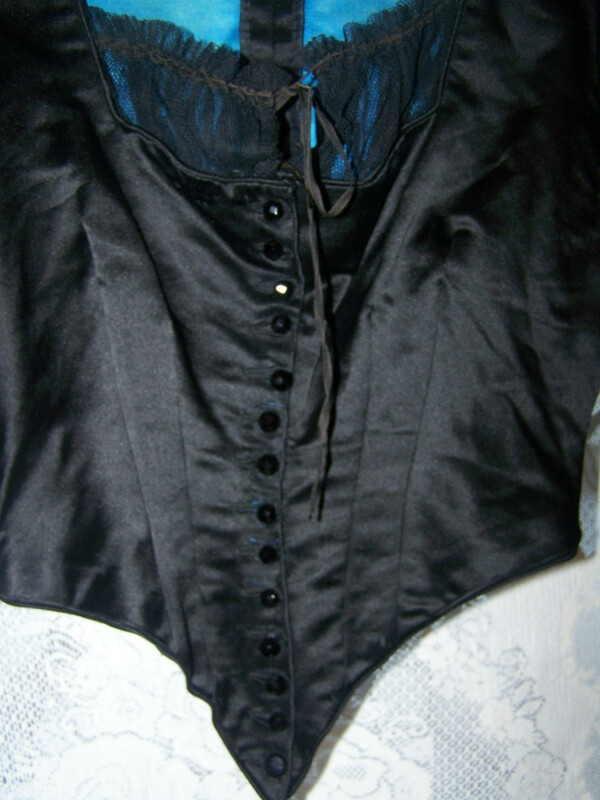 THE BODICE IS A CORSET STYLE WITH 14 BUTTONS UP THE FRONT. THE BONEING IN THE CORSET IS IN GREAT CONDITION (SEE PICTURE 2). 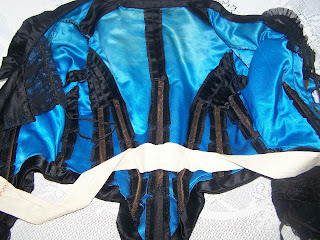 THE BODICE IS LINED WITH A BEAUTIFUL BLUE LINING THAT IS IN GOOD CONDTION. THE TOP MEASURES APPROX. 26" AROUND THE WAIST AND 36" AROUND THE BUST. THERE IS FRAYING OR SHREDDING ON THE SHOULDER (SEE PICTUREC 4). 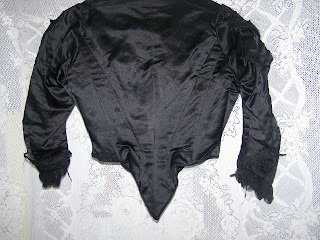 IT LOOKS LIKE SOMEONE DID SOME REPAIRS ON THE SHOULDER PUFFS (SEE PICTURE 5). THERE IS ALSO SOME WEAR ON THE BACK OF THE ARMS (NOT PICTURED AND NOT VERY NOTICABLE). 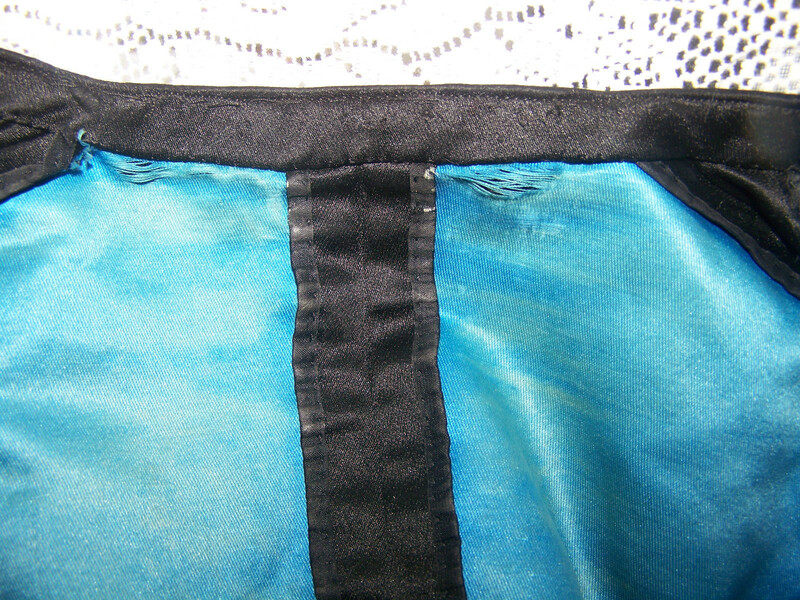 THE SKIRT HAS A 25" WAIST AND MEASURE 43" FROM THE WAIST TO THE HEM LINE IN FRONT AND 52" FROM THE WAIST TO THE HEM LINE IN THE BACK. 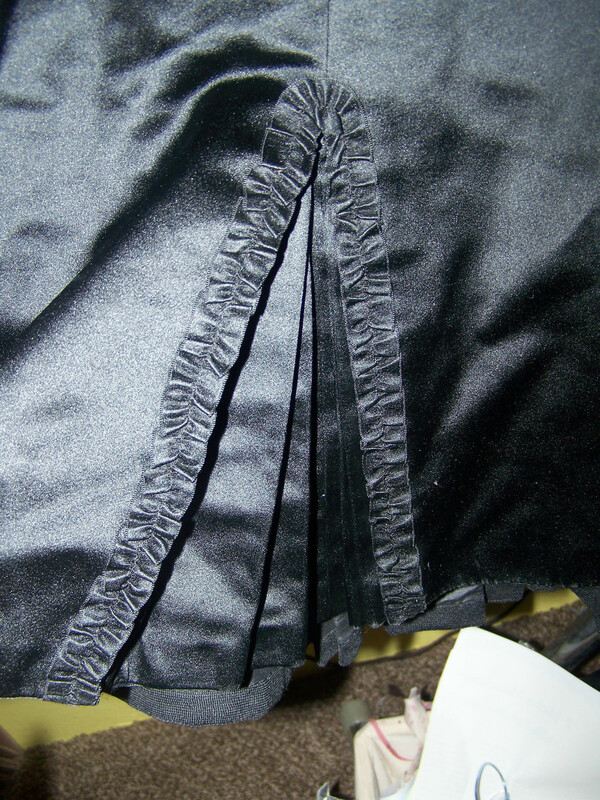 SKIRT IS FULLY LINED. THERE ARE TWO PRETTY RUFFELY PLEATS IN THE FRONT AND TWO IN THE BACK (SEE PICTURE 9). SKIRT HAS A 10" SLASH IN THE FRONT ON THE BOTTOM (SEE PICTURE 10) AND A 2 INCH SLASH IN THE BACK ON HEM. LOOKS LIKE SOME REPAIRS HAVE BEEN DONE TO WAIST AND BACK SEAM (SEE PICTURE 11). PLEASE REMEMBER THIS DRESS IS IN USED ANTIQUE CONDITION, PLEASE DONT EXPECT PERFECTION. IN SPITE OF THAT IT IS TRUELY A BEAUTIFUL PIECE OF HISTORY! I WILL SHIP WITHIN ONE WORKING DAY. RETURNS WITHIN 15 DAYS, BUYER PAYS RETURN SHIPPING. The bodice is not a "corset style". The bodice is a bodice. 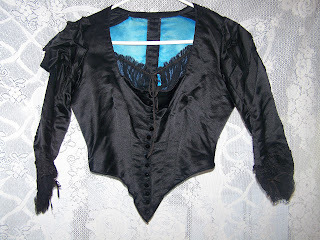 It is in the style of bodices from the late 1880's. Really, the cool thing about the outfit is that fabulous blue lining. I almost think this is a half morning outfit and the lady just was sick of being in mourning.